Display your greenery, blooms, small trees and shrubs in a Stromberg planter made from glass fiber reinforced concrete. The attractive selection of planters available from Stromberg will look good wherever you place them, whether inside your entryway or outside in your garden. Stromberg can produce just about any pattern you can imagine, from elaborate to simple, with striking designs and finishes. A custom planter can be created to match whatever pattern or décor you already have in your home or business. Choose a GFRC planter from Stromberg as a way to introduce greenery into any space. Wherever you decide to place your GFRC planter, whether on a patio, deck or even your front porch, you can feel assured that it will stand up to the elements; moisture, long hours of sunlight, even strong winds won’t cause damage. GFRC planters from Stromberg will help bring life to any area and can be customized to fit any décor. A GFRC planter can be filled with petunias or a dwarf ficus. They can even make a beautiful container garden. GFRC planters are perfect for any room; select your color, texture and finish and let Stromberg Architectural do the rest. These sturdy planters come in a variety of sizes and shapes and can be texturized to mimic natural stone, terra cotta and even wood. Imagine having fresh herbs at your fingertips. Fill your GFRC planter with culinary herbs such as sage, rosemary and thyme. 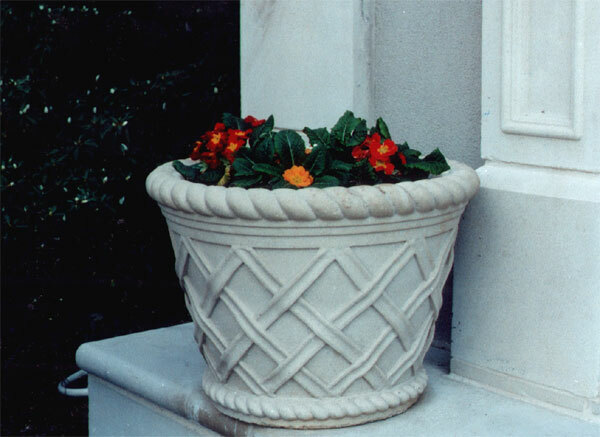 Glass fiber reinforced concrete planters can even be used on balconies, windows and rooftops. Apartment dwellers who want to grow mini-gardens can use a planter made from Stromberg GFRC outside on their patio and be confident that it will stand up to the elements. Place your GFRC planter in your home’s entryway to hold umbrellas and walking sticks. GFRC is a green material; it’s composed of recycled aggregates such as recycled glass and metals. Because of this, GFRC applications can have a more modern look. The properties of GFRC make it an extremely durable material. The glass contents, mix design and production process increase its load-bearing capacity and make it superior to traditional concrete. GFRC is perfect for your outdoor planters because it can stand up to any kind of weather conditions without cracking or corroding. With Stromberg Architectural, you’ll get one-stop assistance in design and implementation of your GFRC planters. Contact the experts today at 903-454-0904 for a free custom quote.